I have my Q now. But before I even had it, I ordered some C mount lenses. The lens on the left is a 25/1.4, available from a variety of chinese sellers. It's very cheaply built. The lens on the right is a real beauty though. A little big for the Q, but with a great precision feel to the adjustments. Plus it's 5.7-34.2mm f/1.0, so the specs are pretty nice too. The crappy part is that it's CS mount, and for some reason I can't guess at no one makes an adapter. I've had a look though it by holding it up to the camera, coverage is close to good enough, certainly good enough for 1:1 format, depending on zoom it might be good enough for 4:3. Resolution seems semi-decent even at f/1.0, though this is very hard to judge without an adapter. If I'm lucky I'll manage to modify one of my adapters for it, once they arrive. ...for some reason I can't guess at no one makes an adapter. Are you sure??? I've run across adapters like that all the time??? Pretty sure. C mount adapters (like the one you linked to) are easy to find. CS mount adapters, not so much. A CS mount adapter would be about 3mm thick, so it's easy to tell from the image that it's not a mis-described CS adapter. I have bought that exact item from that seller, it is certainly a C mount adapter. It is two piece, you *might* be able to get the center section milled down by 5mm which would turn it into a CS mount. I haven't measured if there is more than 5mm of thread available to mill down though. The other possibility is to buy a D mount adapter and have it drilled/tapped for a 1″×32tpi thread. You may need to *slightly* shim the CS lens on this modified mount though due to slight flange differences between D and CS mount. How about a CS to C mount adapter? They seem plentiful too? Would that change the focus distance? "How about a CS to C mount adapter? They seem plentiful too? Would that change the focus distance?" No such thing. What there are are adapters to mount C mount lenses (17.56mm flange distance) on a camera designed for a CS mount (12.56mm flange distance). In that case it is just a 5mm spacer ring, you can use the same ring as a macro extension ring for C mount lenses. I have in fact bought (but not received) both these things, but I don't expect anything I have to modify myself to work until proven otherwise. They go the wrong way. Well, I'm learning that I might not be snagging CS mount bargains around the Bay anytime soon. Thanks Shawn67! Drougge, I have a possibility for you. 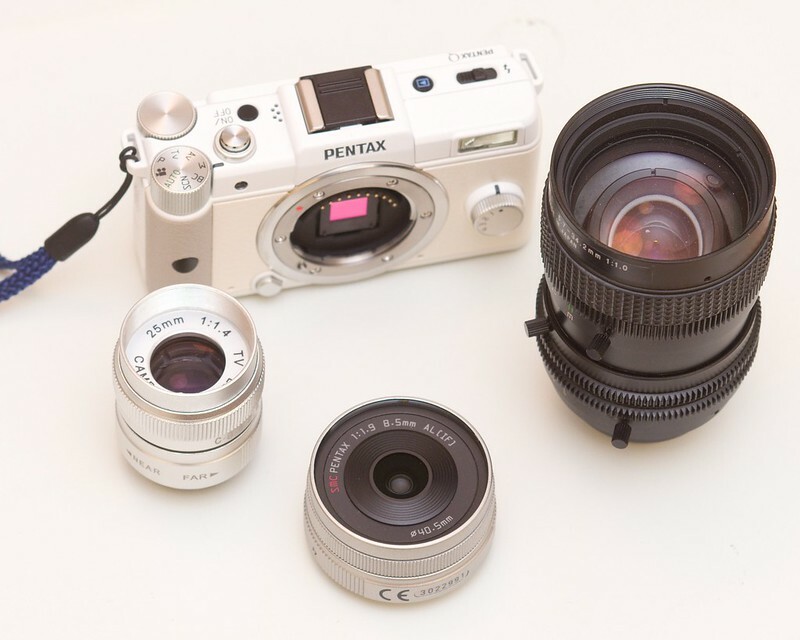 On pentaxforums there is a person that makes lens mounts from solid aluminum cylinders. If you search "making lenses" threads you will find him. The threads have been fascinating. He is wombat2go. He might make or modify one of these C mounts to work with CS for you. He has made Pk and 4/3 mounts from scratch. CS would be much easier. That does sound like a possibility. I might try that when (no, not if) I've failed to modify one myself. But I think I'll try to find someone a bit more local first. As you say, it shouldn't really be that hard to do. Still wondering why the Chinese aren't doing it for me though, seems like I can't be the only one who would buy one (or several). In my experience with CS (I tried to get a 2,5 mm to focus) you'll have to be careful not to touch the sensor with the back element of the lens if you want to freelens it. Other CS-lenses I've tried to freelens are impossible to focus at any distance when they are "outside" the Q body - . Which is strange when you consider the respective flange focal distances of 17.526 mm for a C-mount and 12.50 mm for CS-mount. The C to CS-mount adapters would add 5 mm to the flange distance of a C-mount making it 22.526 mm. Obviously there is something I don't get here...So maybe I'll try the D-mount (Flange focal distance 12.29 mm) adapter. It is going to be interesting to hear about the trials and tribulations of the CS adapter project! Last edited by Erich_H; 11-09-2012 at 06:03 AM. So maybe I'll try the D-mount (Flange focal distance 12.29 mm) adapter. Sounds like a great option if you can enlarge the opening and re-thread the hole! Much cheaper, too. In my experience with CS (I tried to get a 2,5 mm to focus) you'll have to be careful not to touch the sensor with the back element of the lens if you want to freelens it. Other CS-lenses I've tried to freelens are impossible to focus at any distance when they are "outside" the Q body - . Which is strange when you consider the respective flange focal distances of 17.526 mm for a C-mount and 12.50 mm for CS-mount. I didn't actually hold the lens free hand, but put it on the floor and then slid the camera around. Seemed pretty safe (that is, easy to control). And thanks to Barondla for the kind words above about my adaptor projects. It's perfectly reasonable for lenses to need to stick in to the Q, because the flange is not the rearmost part of the lens. The threads always go behind it, and sometimes the optics go behind the thread. CS mount (unlike C mount) doesn't really promise to leave any specific clearance, because the sensor is expected to be bare. Hadn't thought of that (must be age-related...) but of course you're right. Yeah, and you can polish the grease from crappy Chinese CS lenses off of it too. I did...camera still works. Last edited by Erich_H; 11-09-2012 at 06:02 AM.